At Diesel Generator Direct we hold a large stock of gensets in a range of sizes and options to cater for every need, If you cannot find the genset you are looking for on this page, then please get in touch with a member of the team who will be happy to assist. The gensets on this page are organised in power (kVA) size order, you can arrange the sets on this page by price, power or by product name by using the select box above the generators. Gensets come in differing models depending on your requirement, we hold stock of silent generators, diesel generators, petrol gensets, small gensets, portable gensets, tier iiia emission generators, open generators, industrial generators, electric generators, home generators, industrial gensets from global leading power brands such as Pramac UK, Cummins UK or Perkins Generators. You will notice that the gensets on this page are organised and displayed in a manor that makes it easy for you to differentiate one generator over another, the main things to look out for are: the type be it portable or a home generator for example. the power size (usually represented in kVA on our larger sets and kW on smaller gensets. The standby power is when you are using your genset occasionally, like in the event of a power cut and prime application is when you intend to use the generator continuously. The next thing to look out for is the fuel option which will either be petrol or diesel. A final consideration is the startup method, some sets are automatic, some are key start, there are also some small gensets that use a recoil method for start up. We aim to have a genset to meet any requirement however you may need customisations to your generator for your specific requirement, if this is the case, please get in touch to discuss with our team. Here you'll find our wide-range of high efficiency genset from 5 to 300 kVA, use the navigational tools on the left of the page to quickly locate the genset /gensets to suit your requirements. If you cannot find, or are unsure of which is the best genset for you then call +44 (0) 1977 657 989 and a member of the team will be happy to assist you. Our high efficiency gensets (generator sets) cater for a number of applications from small residential or small business backup standby to powering huge prime power off-grid industrial facilities, we have a genset for you needs. 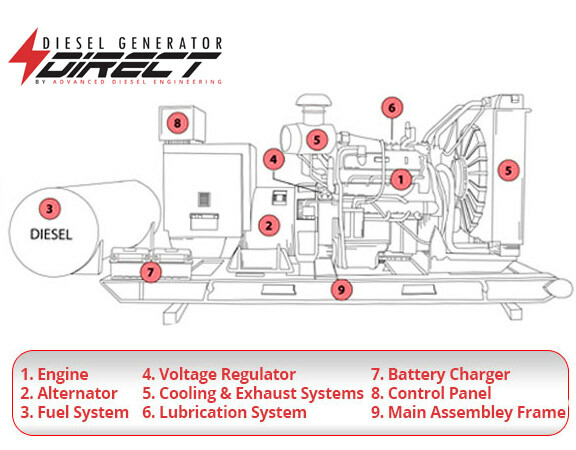 If you cannot locate the ideal diesel generator that you are looking for on this page or, if you require any specific genset customisations such as an automatic transfer switch or custom fuel tank then please get in contact with our team who will be happy to help. We are proud to stock a comprehensive range of high-performance high-efficiency gensets: open or silent canopied gensets, automatic or key start gensets, Tier IIIa gensets, and gensets in a wide range of kVA and kW power outputs.